A building located on the property of an Oakland park that is home to a preschool and an immersion school was badly damaged after a two-alarm fire broke out Saturday morning. 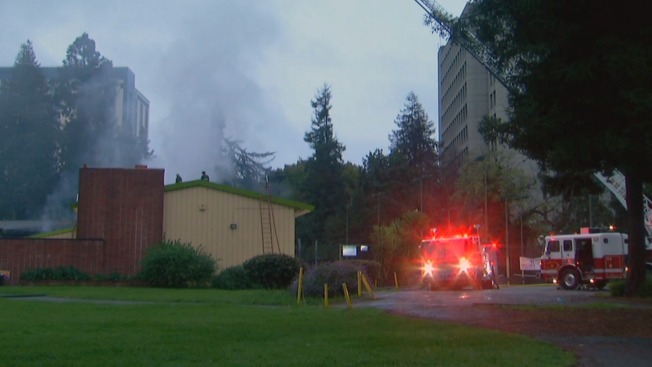 The blaze, which ignited at Mosswood Park located at 3612 Webster St., was first reported around 5:27 a.m., Oakland Fire Department Battalion Chief Zoraida Diaz said. Crews were able to contain the flames within about 60 minutes of arrival. A gymnasium located toward the front of the building appears to be salvageable, but that cannot be said for other parts of the damaged structure. "The classrooms in the back, complete loss," Diaz said. A nearby Victorian building belonging to the city of Oakland was saved by firefighters, Diaz said. The cause of the fire is unknown at this time, but no one was injured, according to Diaz.